Feng shui can also mean the simple rearranging of your home and furniture in harmony with natural forces to induce positive vibes in your home. Feng Shui has its essence in the philosophy of the yin and yang so that there is a perfect balance of harmony in the universe. The same could be said of your home. According to Feng shui, your bedroom is a place of tranquility and you should feel as if it gives you a warm hug each time you walk into it. It is a place where you sleep and rejuvenate yourself. Sleeping should be in an area full of positive chi or good energy. If you do believe in the spiritual and cosmic side of nature and how it could impact your daily life and your home, then follow these guidelines on how to Feng shui your bedroom. A bed with a solid headboard provides you with true protection of positive chi Even if you don’t believe in Feng Shui; you do experience a sense of protection from lying against a bed with a solid padded headboard. Always purchase a new mattress because used ones may not harbor good energy. A supportive mattress will fill you with positive energy. Sleeping on the correct sort of mattress is also good for your back. The concept of Feng shui discourages the use of mirrors in your bedroom. At the most, you should have one mirror only. 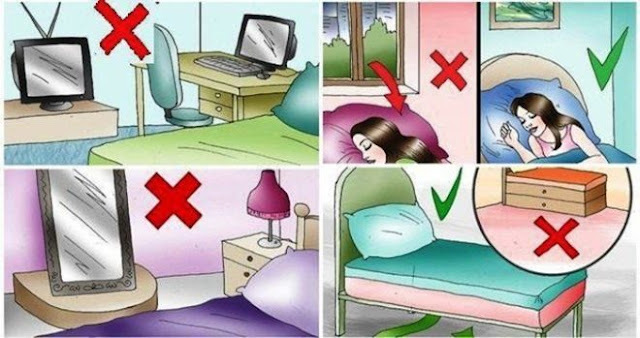 It should also never be placed at any location where your body is visible in the mirror because this will reflect and increase energy which may disturb your sleep. Positive energy should flow all around you when you sleep and should never be hindered, thus to enable its balanced flow beneath the bed, there should be a proper height between the bed and ground. Nowadays several bed designs come with storage drawers but are considered bad Feng Shui it doesn’t allow the circulation of energy around you. Your bed should be placed against a good solid wall that holds the positive energy around you. Sleeping against a window weakens the chi as there is no support and neither do you have any symbol of protection. Although you can place your bed diagonally from a door as far as possible, never place your bed facing a door directly in alignment with it. However you should be able to see the open door which should be in front of you and not at the back. Being aligned in front of the door will result in too much chi and as they say too much of a good thing is also bad. The bedroom should be a quiet and peaceful haven for you free from worldly distractions. It would be beneficial to remove televisions or computers from the bedroom. But, since there are many compact homes with limited space, you can move the TV or desk as far from your bed as possible. When you purchase or rent a home, always ensure the ceiling is flat and it does not have protruding beams which are common to older homes. A protruding beam is a threatening force with the potential to do damage and is always a vessel of negative energy. Never keep your fish tank or gold fish bowl in the bed room. Pictures of water too are not advisable. If you want to Feng Shui your bedroom, such objects need to be removed as they could invite a robbery.